When you look in the mirror? No matter what you call it, double chin, selfie killer, waddle, turkey neck, jowls, it’s all the same, FAT. The #1 non-invasive fat reduction procedure in the WORLD is CoolSculpting and its GREAT for treating any area of fat, including the double chin and jaw line. CoolSculpting is a safe and effective procedure used for eliminating fat cells so they never come back. 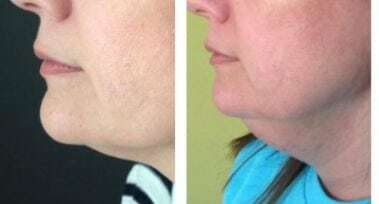 It’s FDA cleared for almost anywhere on the body, including the double chin area and along the jaw line. CoolSculpting of the double chin can literally treat from ear to ear if needed. 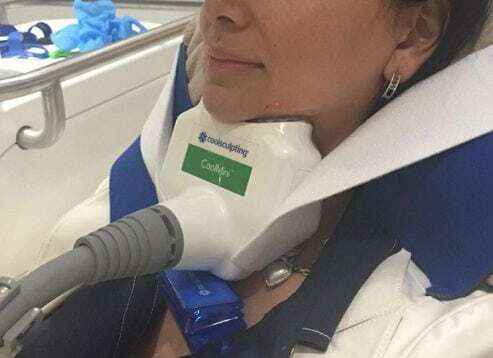 There is no double chin that CoolSculpting can’t handle. Your face is the first thing people see when you meet them. Don’t let your double chin be the first thing they notice. CoolSculpting on the jaw line will slim and trim down the fat layer on average 20% with each treatment. In most people that is enough to define their jaw and get rid of the double chin in just one treatment. 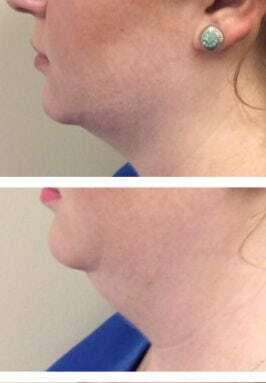 So, what about Kybella for the double chin, the fat melting injection? Well, first of all its not one injection, its typically 25- 50 or more individual injections to cover the area just behind the chin. Then in almost every person requires more than one treatment. So imagine doing those 50 injections and then coming back for more in a month and doing it all over again. The FDA studies for the drug as well as clinical experience since it’s release shows a requirement for 2 to 6 procedures to get desired results. Kybella fat reducing injection for the double chin ALWAYS causes significant swelling in the days or weeks after the procedure. Do your own search and see for yourself real people posting about how shocked they were with the size of the area from swelling. If you are tired of hiding your double chin fat, how are you going to feel when it’s double the size for a week or typically more? “Bullfrog Neck” is a common description of the swelling, and there is NO HIDING IT. These are images of real patients after Kybella injections. These photos were all marked as Day 1 or Day 3 after the injection procedure. The top two images show what the person looked like before the injections so you can see how much swelling is actually there. The image on the bottom right is two angles on Day 1, no before picture was available. Kybella results are good after the series of treatments are completed. Procedures like this are not for everyone though. You decide how much “downtime” or swelling time you can take and how many injections of “bile acid” you want to have. For many of our clients this answer is NONE. They prefer to keep their choice of double chin reduction private and be able to continue their normal daily activities without the downtime. Liposuction surgery for the double chin can leave irregular borders and lumpiness. Plus there is a scar, right there under your chin! If you are ready to get rid of that double chin, improve your look in pictures and get your jaw line back, then CoolSculpting of the double chin is for you! Here’s what you can expect from Liposuction surgery on the double chin. Yes, it’s effective but not without downtime, bruising and swelling in the WEEKS after the procedure, plus wearing a tight chin strap all day every day during those weeks makes it totally impossible to keep your secret of having this done. CoolSculpting causes some mild swelling in the days after the procedure, but it’s mild and usually only noticeable by you as a “bloated look”, not a Bullfrog! It’s gone within a couple of days but even then you don’t need to hide your face (or double chin) while you “recover”. There is skin numbness after the procedure, it’s just been exposed to some super cold temperatures so this is normal and expected. With over 4 million CoolSculpting treatments performed world-wide, no one is walking around with numb skin permanently, it will come back in a few days or possibly a couple of weeks before it’s 100% normal again. The results are gradual appearing similar to diet results you could expect over the next 12 weeks as the fat layer reduces when the fat cells are eliminated from your body naturally. You don’t need to do anything, just sit back and watch that double chin get smaller and smaller over the next 3 months. So what about multiple treatments with CoolSculpting for the double chin? It’s the same as any other area of the body, if you want more results, you have another CoolSculpting treatment in the same area. The FDA studies for CoolSculpting on the double chin included two treatments in the area for full results. The treatment only included the area directly behind the chin. Since that time, we are able to treat along the entire jaw line and by doing so a double treatment just behind the chin. 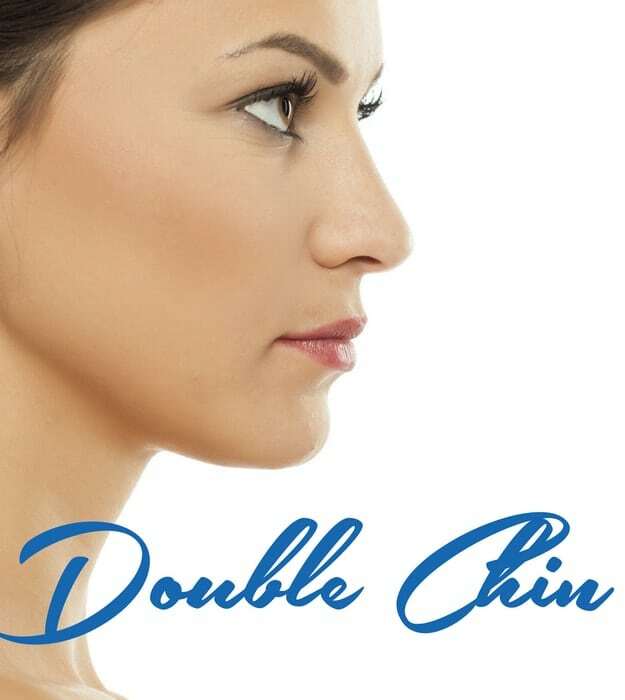 We’ve seen more than one person that a single treatment on either side of their jaw line with the double area in the middle be just enough to fully reduce the double chin with CoolSculpting. Isn’t that what it’s really about? What about the skin? Sometimes that area is more than just fat. Loose skin isn’t fat, it doesn’t feel like fat and it isn’t treated like fat. CoolSculpting results take up to 12 weeks to complete, so your skin has time to retract and tighten over the area while the area is shrinking. If you already have loose skin, reducing the fat won’t fix that. There are other procedures including Ultherapy, Fractora and Forma that heat the deep layers of the skin to lift and tighten we use after CoolSculpting if needed. If you are ready to have a full defined jaw line you can show off to the world, CoolSculpting can do that! Sculpted Contours Luxury Medical Aesthetics has expert CoolSculpting providers in our high volume, luxury treatment center to ensure your CoolSculpting results are the BEST. We use the latest techniques, proven through our own experience to get you the results YOU WANT. Trust your results to EXPERTS that perform CoolSculpting ALL DAY, EVERY DAY. WE have two exclusive CoolSculpting treatment suites and FOUR CoolSculpting systems in one location. We can get you in for your CoolSculpting treatment quickly and when treating multiple areas can get you out up to FOUR times faster than other practices that only have one CoolSculpting system. We are here for YOU!! Voted Best of the City 2015, 2016, 2017, & 2018. A specialty luxury Medical Aesthetics center located in Buckhead. Our focus is to deliver excellent results through the most innovative and proven medical aesthetic procedures performed by highly trained staff in a luxury spa environment. I had such a pleasant experience here and felt so comfortable. Everyone was so nice and friendly, they do great work, very professional and kind. I’m so glad I found this place. The space is very nice the views are amazing. These folks are super professional, honest and wonderful to work with! If you are questioning to have cool sculpting done this is the place to go! Everyone was so friendly and the place is beautiful. Treatment feels like your at the spa. I would love to go back but one treatment gave me the results I have dreamed of and I could not be happier. I highly recommend! Cool sculpt experience: The owner and staff exceeded my expectations with their professionalism, knowledge, and excellent customer service! The experience when getting service here is very spa like . Everything about my experience was great, but at the end of the day, you come to places like this for results which I didn’t receive. I am only 135lbs and height is 5’6. Pretty Pettite! I did the cool sculpting treatment to get rid of my lower abdomen fat. After 4 treatments. I saw absolutely 0 results. I did not gain any weight so I should have seen something. While the staff was very accommodating in treating me Multiple times, I have to say this didn’t work for me after being told that I am the perfect candidate for cool sculpting.This treatment is not cheap so I felt like I threw away quite a bit of money. The owner stated she would send my before and after photos to the cool sculpting company to research my results. She was supposed to get back with me but haven’t heard back since.Pretty dissapointing to have wasted so much time and money to get nothing. I wouldn’t recommend this treatment. Kathy and Staff are AMAZING!!! I could not recommend this place enough. I have had only positive experiences at Sculpted Contours Luxury Medical Aesthetics in Atlanta. I admire Kathy and her staff for being so friendly and always going above and beyond. I am so glad I found this facility. I am very happy with my results! !